Almost always a slave to silicon, Intel this week unleashed a record-breaking modulator that shows its favored material just might play a dominate role in future fiber optic networking. Intel's researchers have turned out a silicon optical modulator that can encode data at 30 gigabits per second, making it the fastest such device on the planet. That speed notches Intel closer to rivaling the 40 gigabits per second of non-silicon devices used today in the fiber optic world. And it places Intel on the cusp of delivering fast, cheap networking hardware capable of rack-to-rack, server-to-server and chip-to-chip communications. "Today's photonics products are made of exotic materials," said Mario Paniccia, a research director at Intel. "They are basically like the Ferrari of technologies. So, the goal is to build these things out of silicon and get to high volume, low-cost products." Vendors and customers alike should benefit from a firmer embrace of silicon-based optical technology. Companies in the optical and processor markets look to drive the techniques used today to carry information over long-haul networks down to the system and component level. Chip companies believe they'll first be able to use silicon photonics technology to create speedy networking channels for communications between server racks. Then they'll follow with blade server-to-blade server links and then with connections capable of funneling enormous amounts of data between chips. 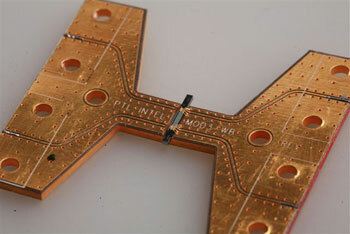 Such a shift means moving away from using copper wires, for example, to push data through chips in favor of light beams. Chipmakers have long embraced silicon for a number of reasons, including the abundance of the material and the ease of use with which it can be handled. These attributes should carry over to the optical world. Intel and others also hope to take advantage of existing chip production facilities and manufacturing methods to create the silicon photonics devices. All told, this would add a level of commonality in both material and manufacturing technique and overall production maturity not enjoyed today by optical device makers. Chipzilla has hammered away at the silicon-based optical devices for years, grabbing a number of key milestones. In 2004, the company cranked out a silicon modulator operating at one gigabit per second. One year later, Intel boosted that speed to 10 gigabits per second and constructed a flashy silicon laser. Intel's latest modulator not only outperforms its predecessors but also consumes less power and takes up less space. With a few tweaks, Intel now thinks it can stretch the 30 gigabit per second device of today to 40 gigabits per second, putting Intel's device on par with non-silicon gear, according to Paniccia. Without a silicon photonics breakthrough, server customers could run into serious problems due to the rise of multi-core processors. "The industry is moving from quad-core to multiple cores," Paniccia said. "As you get to tens of cores and then hundreds of cores by the middle of next decade, you're talking about teraflops of computation power and terabits of information moving between these chips. That's tough to do with copper. You can try and go wider but will be pin limited." At the moment, a pricey non-silicon modulator can cost around $8,000. Intel thinks the price for a similar product made with silicon needs to get to less than $10 for it to be a cost effective server part. "I think we will see silicon photonics commercialized by the end of the decade," Paniccia said. "We are well on the way to that path."